Despite a slight surrealistic feeling when the actors speak English while the surroundings and everything else is in Swedish, the American version of "Men who hate women" is really good. 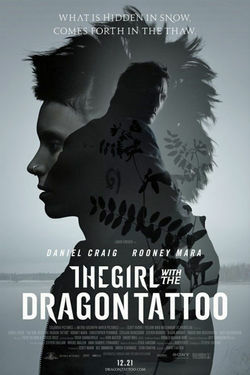 Rooney Mara and Daniel Craig have chemistry between them and Drottninggatan in Uppsala has an important role. Right, let's take that last part first, the part that reads "...Drottninggatan in Uppsala plays an important role." As readers of this blog may remember (here's the relevant post), we who live in Uppsala, and especially those of us who travel by bus, were inconvenienced for more than a month last year by the filming of this movie. People I met on the bus were happy to grump about it a little, but also seemed secretly pleased of course. Who isn't pleased when one's beloved hometown gets some face time in a Big Hollywood production? (And allow me one quick "I'm showing off my Swedish" note: on the movie poster above there's a tagline at the top: "What is hidden in the snow comes forth in the thaw." In Swedish it is an aphorism and sounds better because it's shorter and rhymes: "Det som göms i snö / Kommer upp i tö."